See Madrid at your own pace on a 3-hour city tour with a private driver! With a flexible itinerary, you can see the sights that you want to see while being chauffeured around town. Most tours include visits to exciting Madrid neighborhoods like Salamanca, Los Austrias and Las Cortes (the museum district) that are home to top attractions such as the Royal Palace of Madrid, Las Ventas Bullring and the Prado Museum. Upgrade to include a guide as well as a driver, and learn little-known facts and history about Madrid! After picking you up from your Madrid hotel, your driver will chat to you about what you want to see and where you want to go. Your exact itinerary is flexible, so you can customize your tour based on your preferences – if there’s something you want to see more or less of, simply let your driver know! Want to see the sights with a guide? Upgrade to include a private guide, too, and learn all the insider secrets about the city's history, sights and culture. Traveling by air-conditioned minibus, pass along Paseo de la Castellana (Madrid’s main boulevard), seeing Santiago Bernabeu Stadium -- the iconic soccer arena where Real Madrid play. Head into the the neighborhood of Salamanca, where Madrid’s fashionistas shop for upscale brands like Chanel and Louis Vuitton, and then stop for pictures outside Las Ventas Bullring. The world’s largest bullring, Las Ventas was built to cater for the surge in popularity of the sport in the early 20th century. Admire the building’s distinctive Mozarabic architecture, as you walk around this iconic bullfighting venue. 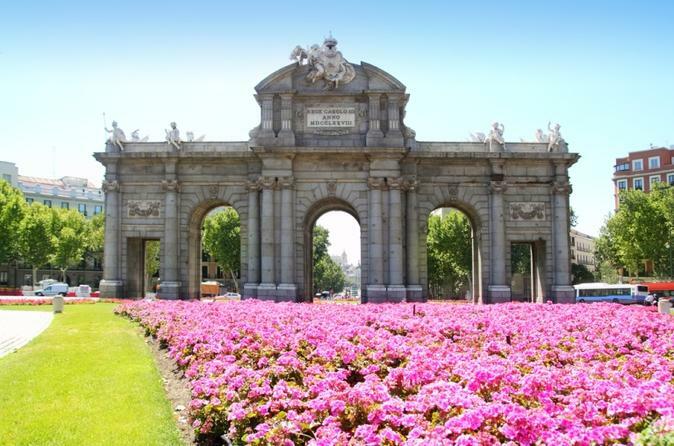 Continue your tour through Calle Gran Via, the oldest Madrid neighborhood, and stop for a stroll around Parque del Oeste, learning about the many statues that abound, like the Temple of Debob – a monument that was donated by the Egyptian government. Travel to the Royal Palace of Madrid (Palacio Reale) in the neighborhood of Los Austrias, and then stop for a walk around it. Follow in the footsteps of Bourbon kings who once lived in this extravagant abode while wandering through its gardens, and then hop back on board your minibus to visit Plaza Mayor, a square that’s thronged with some of the city’s best tapas restaurants. Lastly, head to Madrid’s museum district – home of the so-called ‘golden triangle’ of the city’s leading museums: the Prado, Museum of Contemporary Art Reina Sofia and Thyssen-Bornemisza Museum. Explore the area on foot, before bidding farewell to your driver and finishing your tour.